The repair ship Vestal (AR-4), moored outboard of the battleship Arizona on the morning of 7 December 1941, was hit by two Japanese bombs and received additional damage from the force and heat of Arizona's explosion. Casting loose from the sunk and burning battleship at about 8:30 AM, Vestal moved up the harbor a short distance and anchored. However, one of the bomb hits caused her to flood aft, and the water could not be controlled in the ship's old hull. 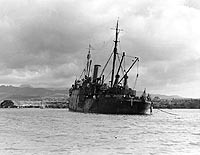 Accordingly, she hoisted her anchor and was beached on Aiea Shoal, in Pearl Harbor's northeastern corner. Vestal was repaired by mid-February 1942. This page features views of USS Vestal on and shortly after 7 December 1941. Commander Cassin Young, USN, Commanding Officer, USS Vestal. "Battleship Row" during the Pearl Harbor Attack. If you want higher resolution reproductions than the Online Library's digital images, see: "How to Obtain Photographic Reproductions." 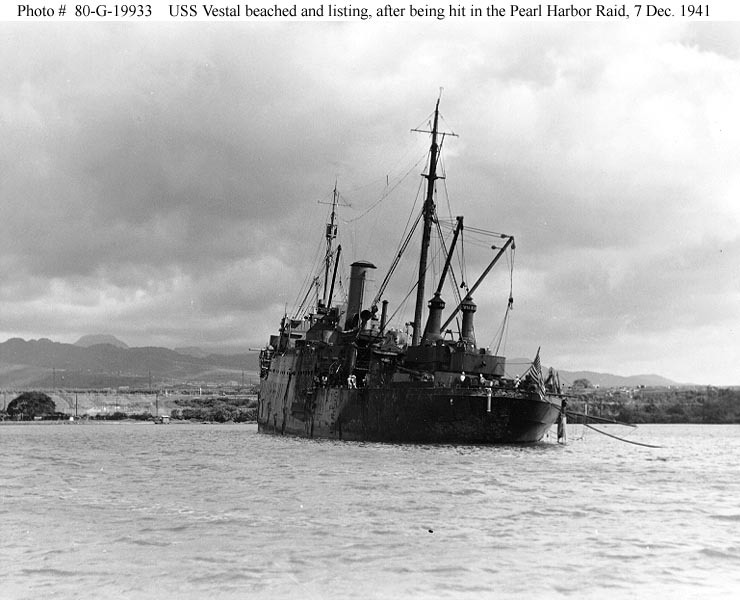 USS Vestal (AR-4) beached on Aiea shoal, Pearl Harbor, after the Japanese raid. She is listing from damage caused by two bombs that hit her during the attack. 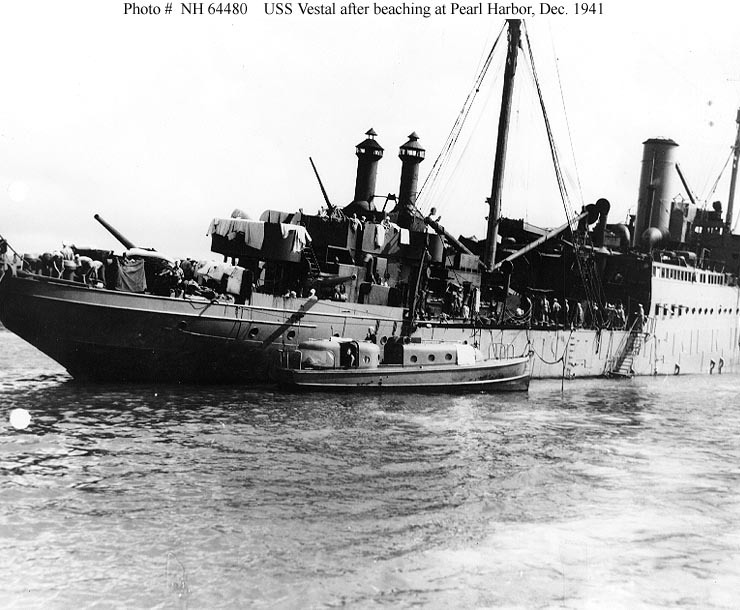 USS Vestal (AR-4) after she was beached in Pearl Harbor on 7 December 1941. She had been damaged by Japanese bomb hits during the raid. An Officers' Motor Boat is alongside her starboard quarter. Official U.S. Navy Photograph, from the collections of the Naval History and Heritage Command. To the best of our knowledge, the pictures referenced here are all in the Public Domain, and can therefore be freely downloaded and used for any purpose. Some images linked from this page may bear obsolete credit lines citing the organization name: "Naval Historical Center". Effective 1 December 2008 the name should be cited as: "Naval History and Heritage Command". Return to Naval History and Heritage Command home page.